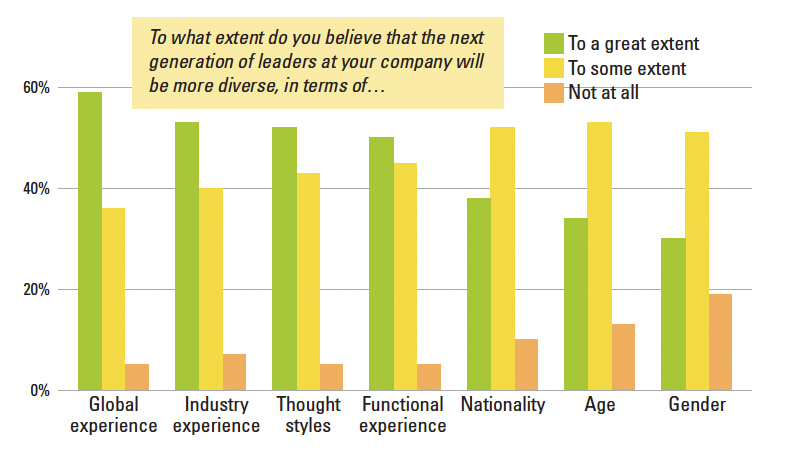 Human resources executives believe the next generation of global executives will be more diverse. Are companies ready? Large global companies today are increasingly led not so much by an individual or even a single team, but by an ensemble of leaders. Consisting of the top one or two percent of executives and experts, ensembles bridge a host of differences — in language, culture, time zones, experience and more. They also make it easy for groups of leaders to configure themselves according to the task at hand. How are human resource executives at global companies preparing for a future that includes such diverse leadership groups? To find out, we surveyed 197 HR executives from global companies in 2012. We defined global companies as those operating in four or more countries across two or more continents. The companies we surveyed met these criteria, and they represented a wide variety of industries and company sizes. HR executives believe that tomorrow’s leaders will need to be more diverse than today’s — especially in terms of thought styles and work experiences. However, HR executives are not giving priority just to a broad focus on diversity. More than 90% of the HR executives we surveyed also believe that next-generation leaders will be working more collectively in the future. Taken together, these two findings suggest that leaders from highly diverse backgrounds will need to work together more effectively. Frustratingly, however, it’s often difficult to promote both diversity and collective action at the same time. Research has found that diverse groups will likely experience more disagreements about their tasks and group processes than homogeneous groups. Robert J. Thomas is global managing director of the Accenture Institute for High Performance and is the author of Crucibles of Leadership (Harvard Business Press, 2008). Joshua Bellin is a research fellow with the Accenture Institute for High Performance. Claudy Jules is a senior principal in Accenture’s management consulting practice. Nandani Lynton is a professor at China Europe International Business School and director of leadership development at A.P. Moller – Maersk A/S.